A few years ago, I began flying on my porch a flag bearing the Human Rights Campaign's equality emblem, inspired largely by the feeling of solidarity and support I experienced when seeing that icon displayed on vehicles I observed while driving, and hoping to provide a similar feeling of support to others in my neighborhood. The first flag became tattered, and I replaced it with a second, which, likewise, has become frayed, owing to the roughness of the bricks against which a portion of it occasionally brushes. Still, the sentiment behind the symbol remains, though the symbol itself is not as crisp as it once was. In any event, pride displays in Norfolk affixed to or associated with structures, be they residential or commercial, have always been sufficiently uncommon that witnessing them still leaves an imprint upon me, whether someone opts for the highly-colorful rainbow, or the more demure HRC equality icon that I've chosen. 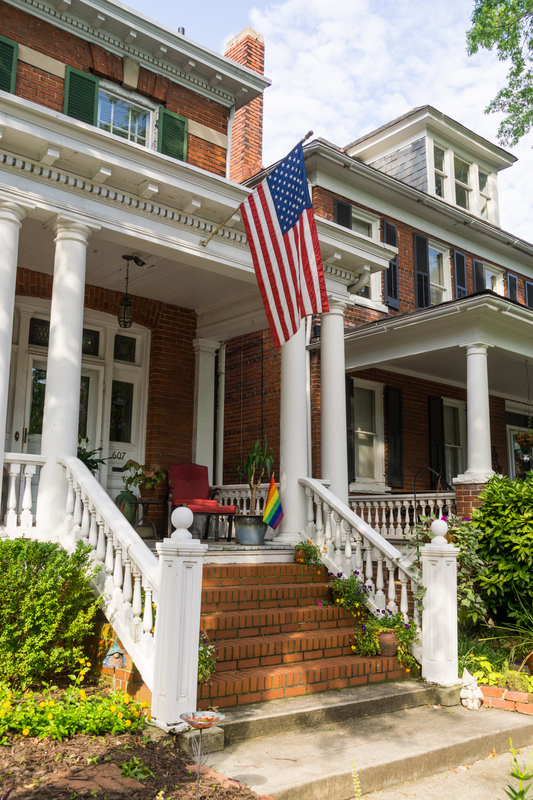 Notably, the Downtown Norfolk Council this year offered to distribute rainbow flags to its members, in addition to supplying tips on making the most of the Pride festival that occurred nearby at Town Point Park. Though I never, during that time, walked through much of the area included within the DNC's territory, I was advised by a friend who stayed in a hotel downtown that there were numerous rainbow displays. While I hope that most of those displays were motivated at least as much by a desire to show heartfelt support as capture dollars from potential customers, I'd suggest that those who have enduring displays, and/or are members of groups such as Hampton Roads Business OutReach, may be more committed than others to the causes of equality and fair treatment that are the real-world embodiments of the spirit symbolized by the rainbow flag and HRC's yellow-and-blue icon. That said, I'm sure I'd have basked in the rainbow glow, regardless, had I witnessed it myself. 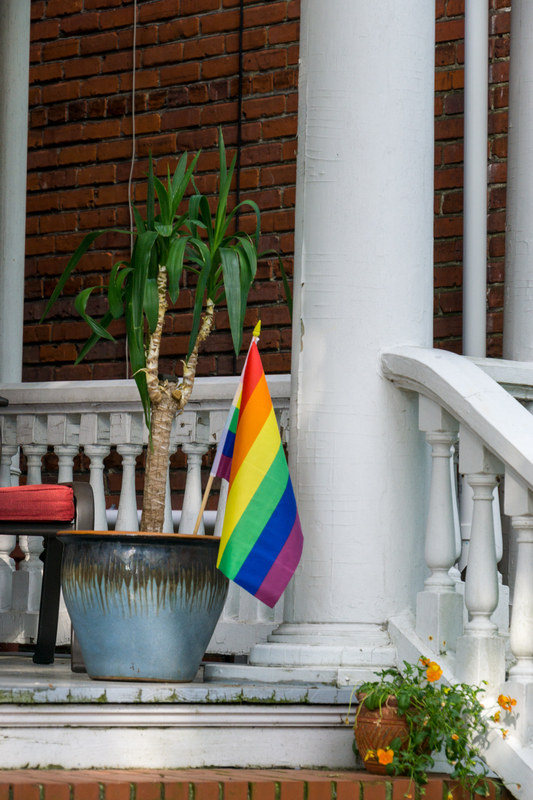 Nonetheless, I'm particularly charmed by organic displays of pride and solidarity, and this year, I observed three -- possibly four -- pride displays on residences in Ghent, plus a few on businesses that lie beyond the DNC's coverage area. 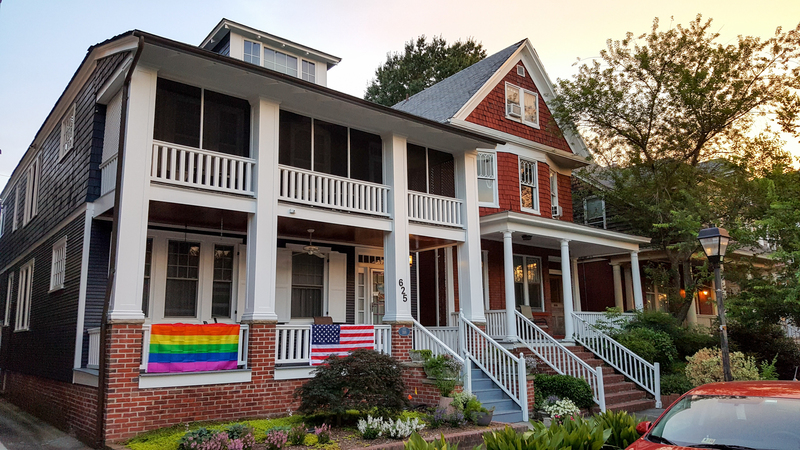 The first pride flag display I noticed on a residence I observed only once, on an apartment or townhouse on Colonial Avenue. I'd planned to return and photograph during Pride Week the unmistakably-large rainbow flag, though it disappeared before I could do so. However, you can see it in the previously-linked Inside Business article, which happened to feature an image of it. In fact, I noticed the Colonial Avenue flag as I drove home from O'Connor Brewing Company's "Pour a Little Love in Your Heart" event, which was an official Pride Week event that the brewery hosted and promoted. 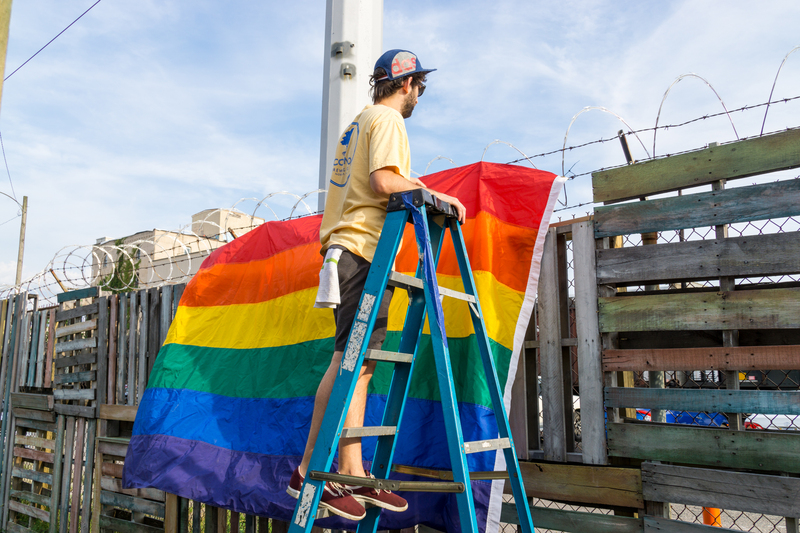 An O'Connor Brewing Company employee rescuing the rainbow flag, which the wind had blown onto the concertina wire during the "Pour A Little Love in Your Heart" event. 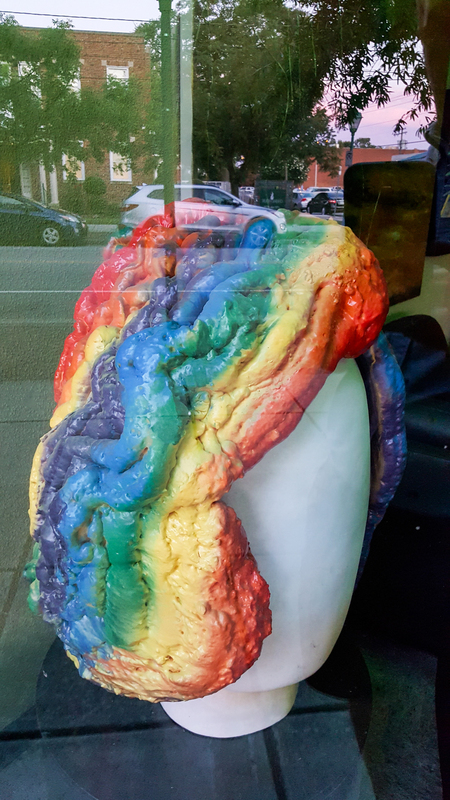 Speaking of businesses, Impressions Hair Salon on Colley Avenue always seems to keep their window displays topically up to date, and for June, they displayed a unique version of the rainbow that was quite appropriate to their line of work. Impressions Hair Salon on Colley Avenue, as seen in June 2017. Now, returning to the residential viewpoint, I'm pleased to say that all of the following displays were observed within two blocks of me. My favorite! It's so bold. Honestly, I really don't know if this one is intended as a Pride display. 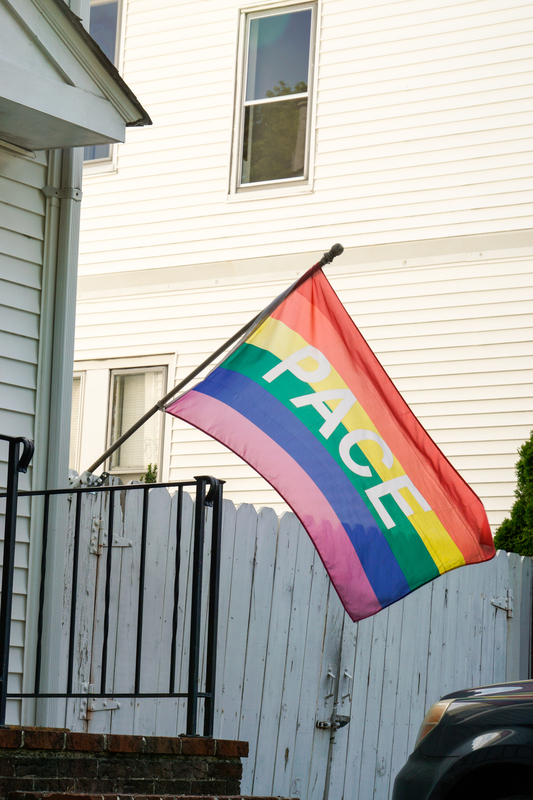 For the longest time, I thought it said "Peace," but when I really looked at the photos I'd taken, I realized it said "PACE," which can be an acronym for an elder-care program, apparently, so perhaps this is a Pride flag with a dual meaning, or perhaps there was no Pride intent whatsoever. A more-discreet rainbow flag display that I nonetheless noticed and appreciated. Lastly, in the NEON District, I have to say that I was appreciative of Bearded Bird Brewing Company's hand-drawn Pride flag and message in their window, plus their small Pride flag inside. In my observations, they were the standard-bearers of Pride displays in the NEON District this year, whereas, last year, between Work | Release and Granby Social Club (both of which have now folded or morphed into other forms of existence), there were more displays of greater prominence. Certainly, though, I know many folks were supportive in meaningful ways and elected not to display an external signifier of such, and I'm sure there were many other displays that did not come to my notice (after all, my travels by car and on foot tend to follow in certain tracks), but I'm surely grateful for those displays I did see and believe to have been born of reflections of heartfelt support. So, until next Pride season, Planet Earth, here's hoping that more folks carry with them throughout the year the spirit of Pride. From a distance, I could not be certain, but was hopeful. "Is that two dudes, perchance, holding hands?" I wondered, as I arrived on the block on which my building sits.